Fahad Hussayn has been one name that has been consistent over the years with both his designs and techniques. Each year he brings to life mesmerizing collections that shatters the barriers of typical and soar high with their unique execution. This time, the designer’s multidisciplinary Imaginarium presents the debut collection for the freshly introduced brand by Fahad Hussayn, PRINT MUSEUM WEDDING Essentials. The debut line is called AGNIKOT, that celebrates a full decade of decadence and opulence. Depicting a beautiful tale of celebration this collection begins the journey into a metaphysical land of splendor and festivity. The complete collection features exquisite wedding essentials, formal wear & luxurious limited edition for both men and women. Inspired by architectural heritage of Lyalpur, infused with the best of local handcrafted embroideries and Zardozi, this is one collection that is both luxurious and at the same time gives the patrons a value of their money. 1. What does this collection symbolize? Playing with our own aesthetics this collection symbolizes the signature Fahad Hussayn couture sensibilities that bring together a beautiful blend of refinement and exquisiteness. 2. What does your collection entail? The complete collection features exquisite wedding essentials, formal wear & luxurious limited edition for both men and women. This is an exclusive collection that comprises of divinely hewed surfaces with signature 3D adornments. 3. What is your inspiration behind it? AGNIKOT is a beautiful fable of celebration as it begins the journey into a speculative land of splendidness and festivity. Inspired by architectural heritage of layallpur and infused with the best of local handcrafted embroideries and zardozi this is one collection that is both luxurious and at the same time gives the patrons a value of their money. 4. What are the materials used? 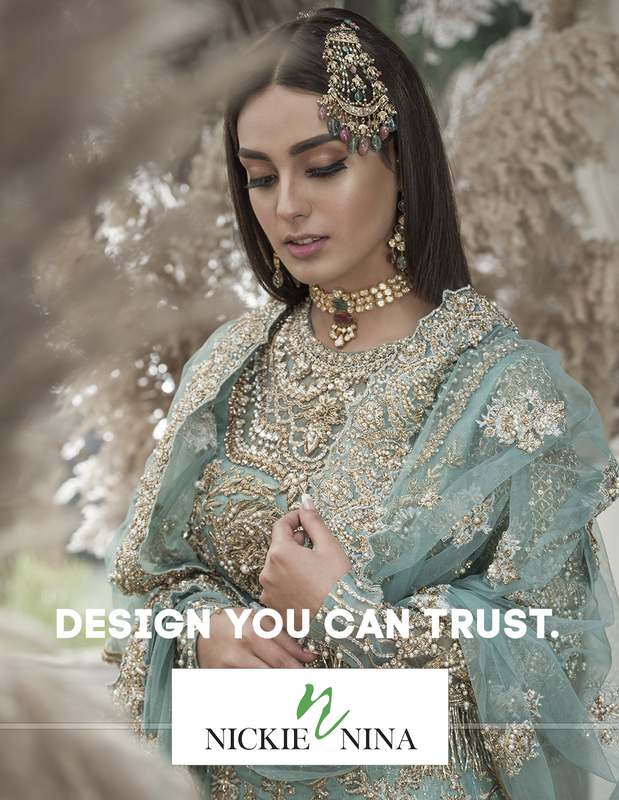 This is collection carry’s the true essence of intricately handcrafted signature details and meticulous craftsmanship on a wide range of fabrics consisting of net, silk, tissue, jamawar and other signature Fahad Hussayn surfaces. 5. What are the techniques used in this? The whole collection is complemented with an amalgamation of techniques and a comprehensive assortment of work on uniquely engineered backdrops such as Zardozi, silkthread, sequim, Marori, Sucha Gota and crystal work. Moreover, Print Museum is the introduction of a distinct new brand by Fahad Hussayn Couture. With Agnikot, it brings a unique new way to increase accessibility of high quality bridal wear unlike ever before. It is a mass-friendly approach curated under Fahad Hussayn’s own sensibilities. The reasonably priced styling options all come with the opportunity to bring each bridal up or down as per a diverse range of prices. The collection also features intricately put together men’s wear with shoes in collaboration by BOOTS.